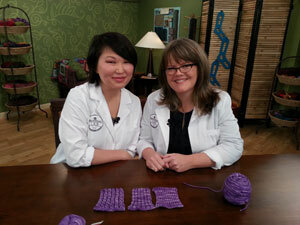 Welcome to the 11th series of Knitting Daily TV, featuring host Eunny Jang and experts Clara Parkes and Kristin Omdahl. Learn new knitting tips and techniques, design one-of-a-kind crochet and knit garments, meet trendsetting designers, and more. 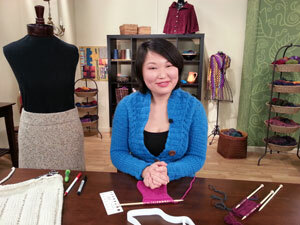 Join Eunny on this Getting Started segment to dive into the basics of knitting a skirt. She'll share her tips and tricks for how to design a skirt with function and fit in mind. Skirts seen here are the Godet Skirt by Amy Miller (on mannequin) and the Fagoted Skirt by Hana Jason (on table), both from Knit.wear Spring 2013. Eunny is wearing the Camille Cardigan by Gretchen Ronnevik, the cover sweater from Knitscene Winter 2012. Kristin Omdahl, crochet and knitwear designer, joins Eunny for this how-to segment on crocheting ruffles onto a knit or crochet skirt. Combining knit and crochet stitches in the Flamenco Ruffled Drawstring Skirt is an eye-catching combination. 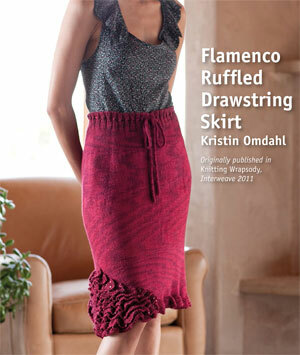 This skirt, from Kristin's book A Knitting Wrapsody, is available for download. Kristin is wearing a scarf design from her book The Finer Edge. Yarn expert Clara Parkes joins Eunny in the knitting lab for a look at resilient yarns, or yarns that hold their shape. Seen here is Zen Yarn Garden's Serenity Worsted yarn. For more information, visit Zen Yarn Garden's website. Eunny wraps up this episode with a quick tip for all fiber artists: how to make a waistband. This tip is perfect for your knitted skirt. She'll show you how to sew down a casing for either a drawstring or elastic, making your skirt snug and secure.